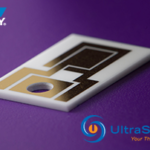 UltraCapacitor™ employs the same technology used in UltraBridge™. 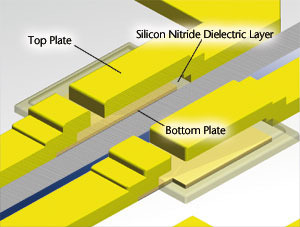 By employing the silicon nitride as the dielectric layer between the upper and lower electrodes, UltraSource is capable of integrating capacitor elements from 2pF to 250pF directly into thin film circuit designs. Spaces as small as 1 mil (25.4 microns), controlled to tolerances of 2.5 microns, can be achieved. With capacitance designed in, the door is open to a variety of other component integration ideas.